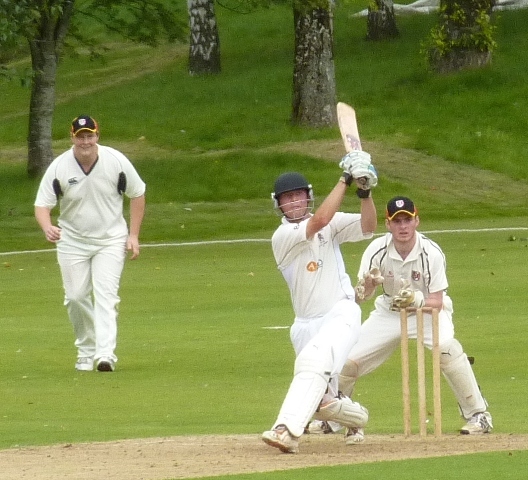 A century at Nunholm by Drew Dawson capped the APD Dumfries league season by ensuring a final match win and their fifteenth win of the season. Already declared champions of National League Division 2, a possible anti-climax to the season was avoided when the side posted a first innings total of 253 for 4. In reply SMRH were all out for 168 with wickets shared amongst the Dumfries bowlers. 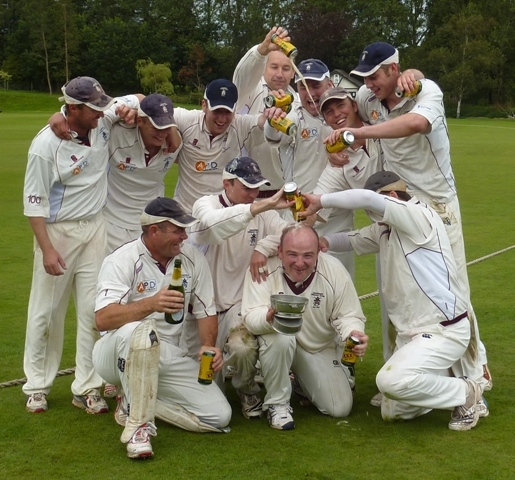 Immediately after that 85 run win the league trophy was presented by Cricket Scotland to Captain Stuart Corbett-Byers which in turn was followed by the rest of the team wasting yet more champagne, or a cheaper Spanish equivalent, over the captain in celebrating a winning climax to the season. Dumfries opted to bat first at home and with a new opening partnership of Tom McBride and Drew Dawson. The opening bowlers Coyle and C Bissett tested the batsmen on a wicket which offering some movement and the opening was steady rather than spectacular and after ten overs the Nunholm side had reached 26. More attention grabbing at the time was the musical accompaniment for the occasional boundary. In the spirit of celebrating the last day of a successful season a musical fanfare from the house DJ greeted boundaries and wickets during the match and caused a few to metaphorically fall off their chairs. SMRH took the music in good spirits but must have been intrigued when “Bad Boys” heralded the arrival of the openers. Meanwhile back at the cricket the openers were intent in providing the solid platform with the fifty coming up in the 17th over and the hundred in the 31st. It was at that point that McBride, looking to boost the scoring rate, came down the wicket and was comprehensively bowled by the other Bissett (G) for 43. Another productive partnership followed between Andy Parkinson and Dawson which took the score onto 181 when the former was stumped advancing half way down the wicket for 39. However that was with just six overs left and with a run rate at just over four an over. Dawson experienced the nervous nineties when the day’s barbeque nearly started early after he survived an interesting run called by new partner Corbett-Byers. However he did make the three figures for an excellent innings and his first century for Dumfries, only to be immediately bowled as he too tried to push on. The innings in the final overs required an injection of runs and that was provided by Corbett-Byers as he wielded the short handle to the short boundary with devastating effect. He proceeded to launch four sixes as he rushed to 46 and was run out attempting an ultimately futile run with one ball left. Davie Davidson made the most of that one ball by hitting it for a straight six before making his way back the pavilion. Dumfries finished with considerably more than was being anticipated closing on 253 for 4 having added nearly one hundred in a hectic last ten overs. There were several mutterings of “game on” as SMRH carved out a similar start to Dumfries. Unlike recent weeks opener bowlers Maskrey and McCutcheon were unable to make a breakthrough but Beveridge did with a wicket with his fourth delivery with G Bissett skying a outside edge to backward point. 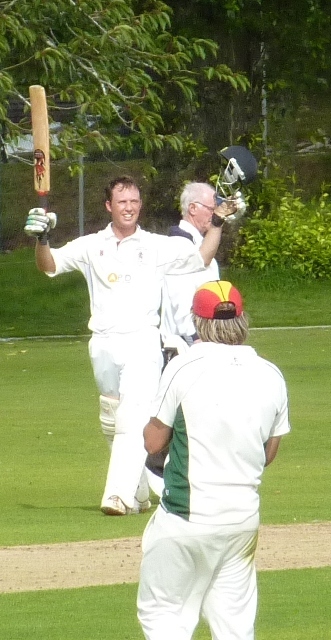 After 25 overs it required David Davidson to take over keeping duties from Byers for more wickets to fall. A. Brock was batting well and SMRH were effectively mirroring the Dumfries innings when he was out to Jim Patterson for 33. Then with the score on 96 Brotherston delivered two run outs from mid on as the batsmen mistakenly took him on and Patterson also dismissed the number four to effectively settle the result. Thompson scored 31 but was nonchalantly stumped by Davidson off Goodin. Douglas Brotherston took his first National League wicket thanks to a wonder catch by Goodin with Scott Beveridge doing all the hard work. A high off drive by C Bissett looked destined for six over long-off but Beveridge lined up the boundary rope, took the catch, and was able to throw the ball across to Goodin at long-on whilst in mid air and over the line for the catch to be completed. It was left appropriately to Captain Byers to take the last wicket of the season in his only four deliveries of the season. The catch, also appropriately, was caught by Man of the Match Dawson at midwicket to complete an 85 run win. After the match skipper Byers said that “it was an absolute pleasure for me and for Jim Patterson to captain the side this season” and paid tribute to the team effort and the hard work put in by everyone in training during pre-season and the summer.